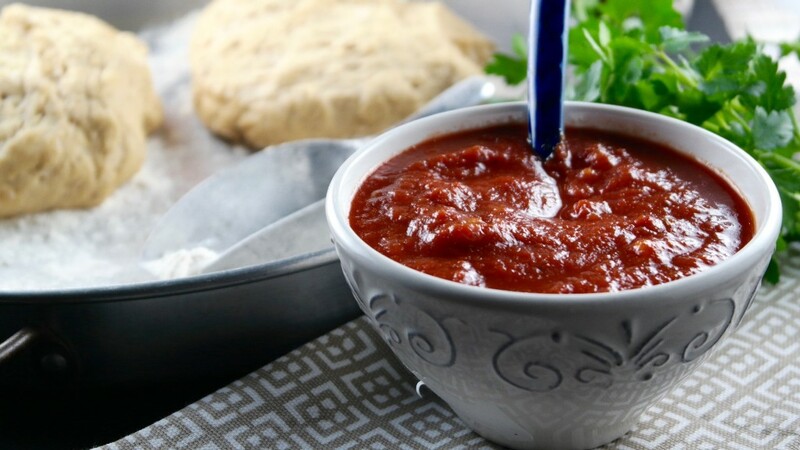 This delicious Pizza Sauce Recipe is easy to follow and will be your “go to” sauce for homemade pizzas! I’ve been playing around with this pizza sauce for awhile and every time I think about sharing the recipe I decide that it’s too boring of a recipe and move onto something else. Silly since pizza is truly a universal food that almost everyone enjoys… AND homemade pizzas are the best tasting pies ever! Alan and I order out for pizza far too often, so I’ve been sneaking in some homemade pizzas instead of dialing for delivery. At times it can be convenient to order out, but I always feel like we might as well be playing the Lotto with the money we spend at our pizzeria. Instead we should toss those bucks into the wishing well! Am I right?! Once you start making your own pizza dough and sauce you’ll see how inexpensive and easy it is to make on your own, plus you can pile on all your favorite toppings without forking over an extra few dollars for a sprinkle of olives or fresh basil! 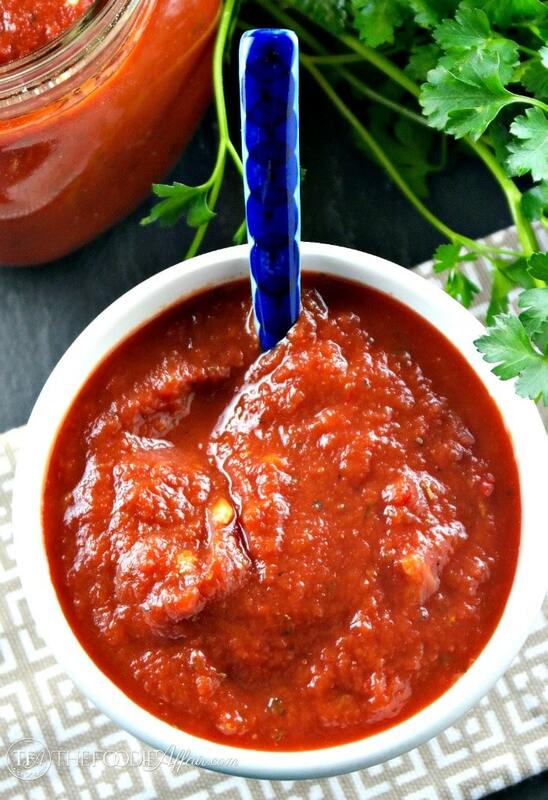 This sauce has a pinch of red pepper flakes that heightens the flavor bringing a little zest to the sauce. Give it a try with this no rise whole wheat pizza dough and swing by later this week for the beautiful mess you see below! 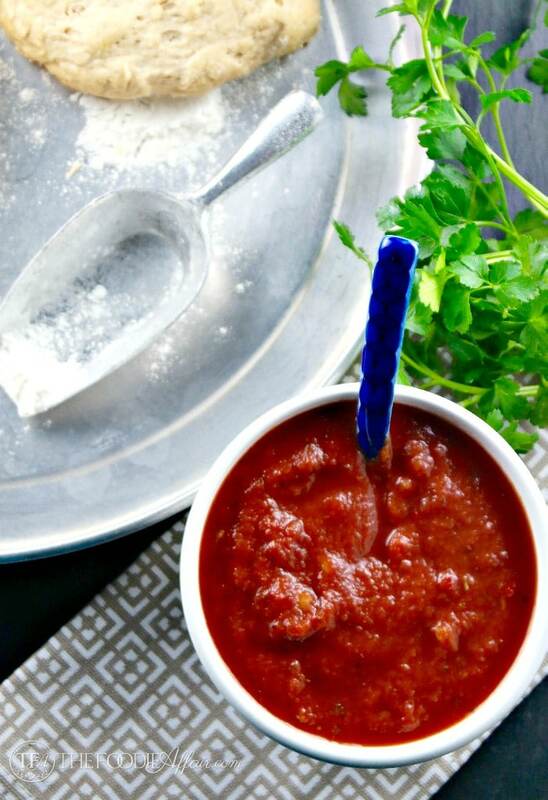 Simple and flavorful pizza sauce for homemade pizza, or use as a dipping sauce. Add oil to a medium saucepan and on medium-high heat cook onion until it begins to soften (1-2 minutes). Add garlic and cook until fragrant. Add the tomato puree and mix ingredients together. Add salt, Italian seasoning, red pepper flakes (optional) salt and pepper. Reduce heat and simmer for 20 minutes. All the bottled pizza sauce has a lot of sugar. This is a fabulous recipe to make it at home and so much healthier. I’m glad you noticed that there is no added sugar. When you start with a good tomato sauce there is no need to sweeten it! Hooray for homemade! It’s always better. This looks delicious! This looks lovely. I regularly make homemade pizza so will have to give these a whirl! Isn’t homemade sauce soooo good! Love it and it’s fun to play around with different ingredients too. Try it with some grated cheese! We make our own sauce too…it is so much better than the take-out sauce. Love your beautiful sauce here! We always make our own and will be trying your recipe! I do love making homemade pizza about once or twice a month. 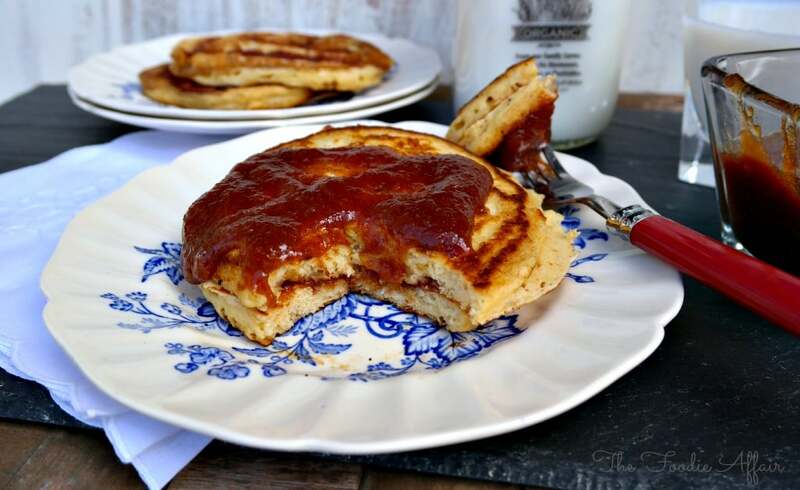 Though I always make the dough from scratch, I am so guilty of using the jarred pizza sauce, lol! 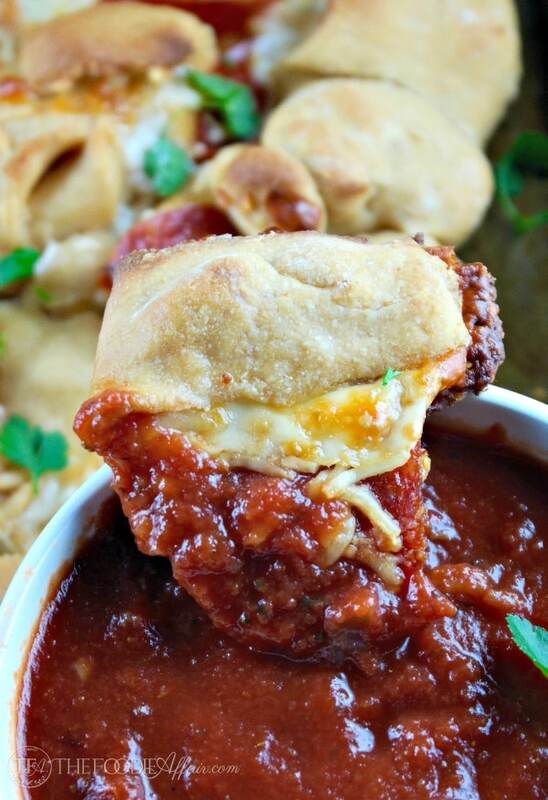 😉 I definitely want to give your homemade pizza sauce a go soon next time. I love making homemade pizza with my boys! This sounds like it’s gonna be my go-to pizza sauce from now on! I have tried to compose myself and resist licking my computer screen. I have reconciled that the only way to stop thinking about this pizza sauce is to make my own batch. Pizza is on the menu for Friday night. Thanks Sandra.. Pinned!